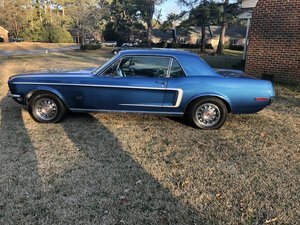 This 1967 Ford Mustang Fastback has had the same owner for the last 40 years. Iconic car in the collector market, this was an original 289 car with AC, and is now powered by a Ford motor Sport crate 351 Windsor backed by a C6 Automatic Transmission with transbrake, power 4-wheel disc brakes, power steering, front wheel line lock, and 9 inch Ford rear end. New side louvers and original hood come with the car. Offered at $63,000 OBO.